Golf help for the high handicapper! FORT WORTH, Texas, January 24, 2018 — Ben Hogan Golf Equipment Company, LLC, manufacturer of premium golf clubs and golf bags, proudly announces that the Company has inked an endorsement contract with PGA TOUR and PGA Champions Tour Professional Mark Brooks. As a PGA TOUR Professional, Brooks has enjoyed seven PGA TOUR victories including; Canon Sammy Davis Jr. Greater Hartford Open, Kmart Greater Greensboro Open, Greater Milwaukee Open, Kemper Open, Bob Hope Chrysler Classic, Shell Houston Open and in 1996 he won a major — the PGA Championship playing Ben Golf Equipment. “It is a real privilege to have Mark back on the Ben Hogan staff. He has been a long-time supporter of the brand. Mark has always revered the product as it played a fundamental role in many of his career titles, particularly the PGA Championship. We are excited about this renewed partnership and look forward to helping him succeed in the 2018 golf season,” commented Scott White, President and CEO of the Ben Hogan Golf Equipment Company. 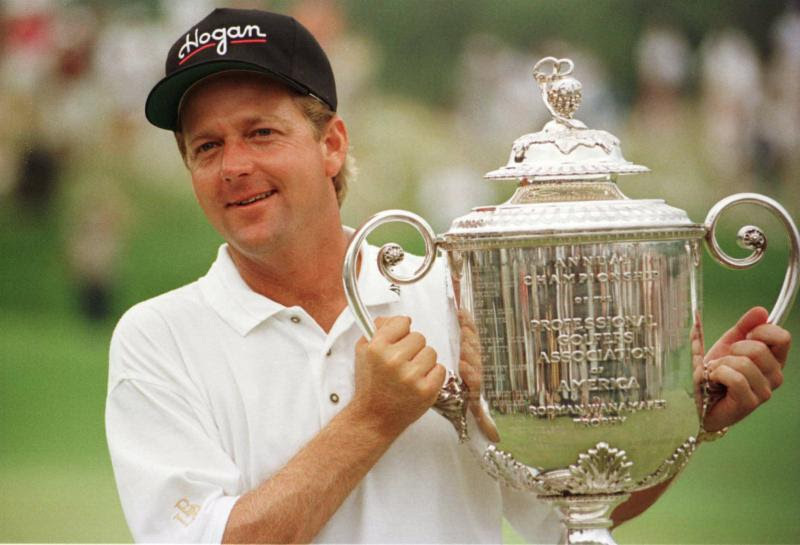 1996 was not only memorable for Brooks because of his first major victory but also for representing the United States in the 2nd President’s Cup. An event where he helped the United States team to win the title and beat the competition by a margin of 16 ½ to 15 ½. Again, he had his Ben Hogan Golf Equipment in the bag on the team’s path to victory. Brooks has exempt status on the PGA TOUR for his PGA Championship victory but primarily plays on the PGA Champions Tour. In 2017, Brooks captured three Top-10 finishes which includes; (T-7) Insperity Invitational, (T-8) Mitsubishi Electric Classic and (T-10) at the Chubb Classic. He also is a partner at the highly acclaimed golf course firm of Knott-Linn-Brooks House based in Palo Alto, CA. In 2015, Brooks was hired by Fox Sports as a course analyst for the network’s U.S. Open coverage. Brooks, like fellow Ben Hogan Golf Company staffer J.J. Henry, resides in Ft. Worth, Texas – just miles away from the Company’s headquarters. Brooks is known to frequent the manufacturing plant often to tinker with his own clubs, or work on new designs. As with Henry, Brooks will be instrumental in the new product development process, and will act as a strategic advisor to the Company. Ben Hogan Golf Equipment Company manufactures premium golf clubs and golf bags, and is committed to continue Ben Hogan’s reputation of innovation, performance and classical designs. The company is based in Fort Worth, Texas, Ben Hogan’s longtime home and the site of the original Company which opened in 1953. The Company offers their premium products online at www.benhogangolf.com exclusively. By eliminating the retail “middleman”, the Company’s cost structure is minimized and consumers are able to purchase high-quality golf equipment at factory-direct prices. To learn more about Ben Hogan Golf, please visit www.benhogangolf.com. Why #PlayYellow with Jack and Barbara Nicklaus? What’s John Daly Up To? What's John Daly up to?